And you know what the most delicious part of this project was for me?…making connections with these amazing ladies has affirmed my work and given me a profound sense of belonging to a collective of strong and inspiring women. And this serves to remind me of the circle of beautiful and loving goddesses who surround me (at varying distances!) in my life. 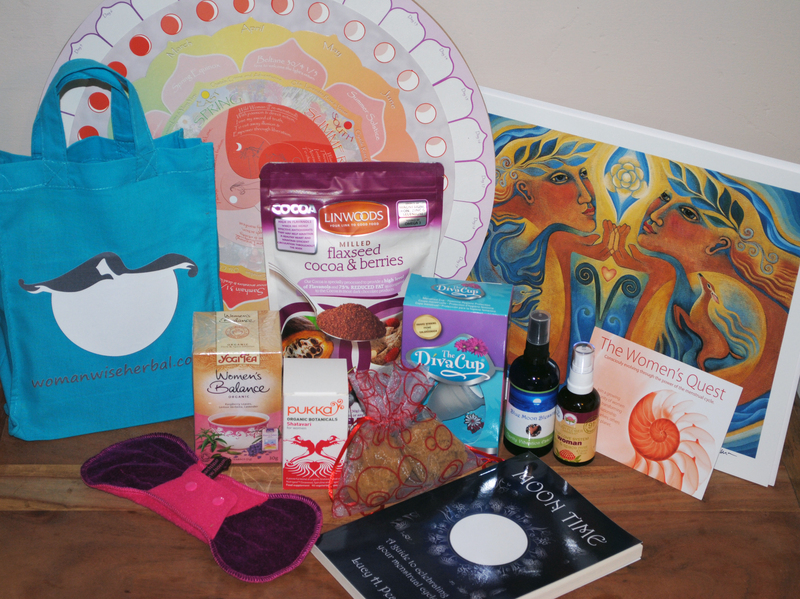 So: here’s how you can be in the draw to receive this blooming, shiny bag of abundance and goodies…share, share, share!!! Visit our FB page and share that post with as many ladies as you can. Every time you share you will be entered into the draw, more shares = more chances!!! Then a number will be randomly generated and the wonderful winner announced on the Winter Solstice, 21st December. Imagine living in a culture that honoured women’s bleeding time (moon time) as sacred. There used to be a time when women’s sexuality was not separated from spirituality. These cultures understood that a woman’s bleeding time was a sacred time, a time of deep introspection, a time for her to shed her outward responsibilities, to retreat to the moon lodge where women would reflect and reconnect with themselves. Their resulting dreams and visions would be shared for the benefit of the whole tribe. This withdrawal into the moon lodge has been misinterpreted as a time when women were ‘dirty’ and might ‘contaminate’ anything they come into contact with – therefore they were not ‘allowed’ to perform their usual household chores. In fact it was a choice. I think this misunderstanding has been the source of a lot of misinformation. Interestingly, the original meaning of the word Sabbat was a day of rest while the Goddess was menstruating! But for most western women of today’s modern society, just to consider honouring our menstrual blood might seem outrageous. We have travelled so far from the time of honouring our female bodies. So how do we embrace our moon time? Let’s begin by looking back at our lives and the messages we received as young women. Maybe you were lucky and you were honoured and embraced. But many women were not. Many were given messages of shame, disgust, and disappointment, often by other women. We still perpetuate these messages today. How differently would we feel about our bodies, our bleeding, and our sexuality if we had been given positive messages of love, beauty, and acceptance? Would we still hide our bleeding-time in shame? Today’s menstrual woman in the western world lives in a male oriented society which influences her perception of the world and herself. This society offers no guidance, no structures for the feelings and experiences of the menstrual cycle, nor any recognition of it. So how do we begin to go about filling this gap and reconnecting to our cycle? My first step was attending a “Healthy Cycles” course. This was a weekly gathering of women sharing their experiences of their menarche (first period). 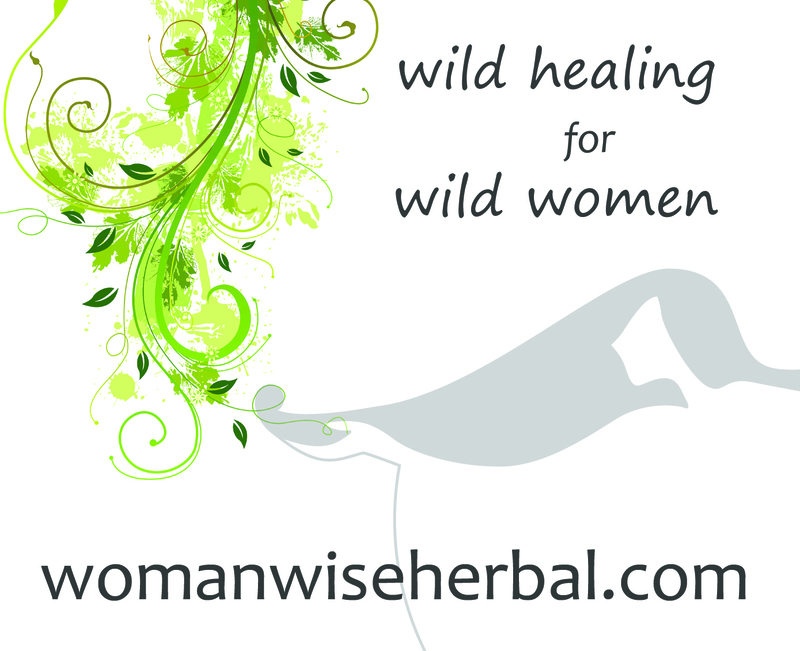 We explored herbs that eased PMT and cramps, and that encouraged or decreased flow. We sang and chanted, meditated, drew and made moon necklaces. We learned how to chart our cycle, about its connection to the moon, about natural fertility and contraception. At the end of the course we organised a ritual – similar to what a menarche ceremony may have been like. It was beautiful; we sang and blessed each other. For me this was a life changing moment: I experienced a huge healing shift in my consciousness and my body. I had been brought up to believe that menstruation was a biological disadvantage, making women emotional, unreasonable and unreliable workers. I went through my teens and into my twenties hating myself, feeling guilty for being depressed, irritable, bloated and clumsy at certain times of the month. My first period was not celebrated – it was shamed. I had no rites of passage, no guidance, it was hidden away. As I got older my sexual energy was feared and called ‘dirty’ and my curvy figure was called ‘fat’. Attending these weekly gatherings helped me to move away from the negative messages I had been given as a child and young woman and enabled me to see myself in a different light. It also set off a spark in me to want to help other women change their attitudes around their cycle. Many women feel that they missed out on celebrating their menarche. They have a deep sense of loss that their transition in to womanhood wasn’t honoured or recognised. I encourage women to create a ceremony for themselves and reclaim their menarche. Many tribal traditions celebrate a young woman’s menarche with ceremony to recognise and honour her first blood. Here in the West it is no longer customary to celebrate menarche in such a way. Mothers will sometimes honour their daughter with a gift, or allow their daughter to have her ears pieced as a marking of her steps in to womanhood. But there is no gathering of wise elders, no coming together of the community as there used to be. How a young woman is guided through this experience will affect her for the rest of her life. I believe that we desperately need to expand and build on these positive, illuminating rituals and celebrations in the lives of adolescent girls and wounded women. It is my hope that when a man or woman shares in these rites that they will be able to take away a little ancient magic for themselves. After the first year or so of bleeding our menstruation should have taken on its own pattern of cycling. Women’s cycles can vary but most of us will bleed every 28 days or so. Prior to the actual bleeding we may have what is medically termed as ‘PMT’ or ‘PMS’ (Pre-Menstrual Tension or Pre-Menstrual Syndrome). I used to suffer from PMT two weeks out of four, from ovulation to my time of bleeding. Since becoming more in tune with my cycle my PMT has lessened. Now I have one day of feeling crabby and out of sorts, my skin usually has a break out but that’s as bad as it gets! I believe PMT is our body’s way of telling us to go within, reconnect and spend time with ourselves. We are so busy ignoring our periods and ‘doing’ life we have forgotten how to just ‘be’. PMT is telling us to ‘be’. 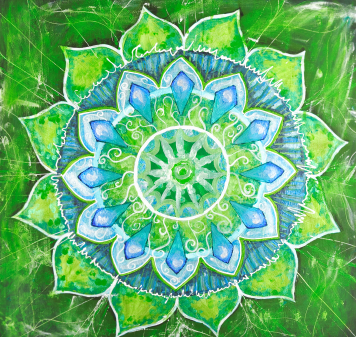 If we are experiencing awful PMT we can tune in to our inner wisdom to try to connect to what this imbalance is about. What else are we preparing to gestate in our life? What other seeds are awaiting fertilisation and implantation? Creative projects, big ideas, decisions? Not all our dreams and desires can be fulfilled in one short menstrual cycle but are we working towards those goals, are we acknowledging our needs, are we making some progress in life’s plan? To help ease PMT I recommend plenty of rest and relaxation – make some time for yourself, time to just ‘be’. Create your own ‘moon lodge’, a quiet space to meditate, do yoga, write, dream, draw or sew. Eating a healthy balanced diet is important, food that allows your body to detoxify for a while. By giving our body the nutrients it needs, our PMT becomes more manageable. As our body is supported and nurtured, it will support us on other levels – mental, emotional and spiritual. As you heal and address your relationship with your cycle, your PMT will decrease. Some women struggle to recognise their PMT time – this is where charting your cycle can help. Knowing that our mood swings or food cravings are just a symptom of our cycle can empower us to overcome them or allow us to surrender to them. Charting your cycle can be done in many ways. One is to note the position of your cervix. You can also chart your cervical mucus and your body temperature. Some women use charting as a tool for awareness of fertile times – a natural contraceptive or useful if they are trying to become pregnant. Others use it as a means of being conscious of their connection to the moon’s cycle or just so they have an idea of when they will bleed.Whatever your reasons it is a wonderful way to reconnect to your cycle. The most basic way to chart your cycle is to keep a diary- noting in it when you bleed. With this you can go in to as much or as little detail as you like. Some women like to write things like – how heavy their loss is, how they feel, physical symptoms; cramps, back ache etc. You may want to prompt yourself with some questions. With relation to your inner life, ask yourself:Do I take time alone?What do I dream?What are my feelings?What do I need to say- and to whom? And your outer life: What am I eating?When do I play?When do I exercise?How does my body feel? What am I wearing – do I feel attractive? Of course, along with bleeding comes sanitary protection. We use approximately 15,000 disposable sanitary items in our lifetime – to hide our bleeding. We shove a non-sterile wad of cotton wool up our tender, sensitive vaginas so that no one knows we are bleeding. There are now alternatives – washable pads, sponges and mooncups. You may wonder how using these alternatives can help us? I believe that the physical act of washing our pads, cups or sponges connects us to our blood and our cycle. Washing your blood out can be a mini ceremony each month – taking the time to nurture, reflect on and respect the rhythms of your body as you wash.
Our daughters, nieces, cousins and god daughters, all need to be guided through the transition into womanhood with as much awareness and sensitivity as possible. We have to be there for them, to guide them through the emotional waters of their menarche, share our wisdom with them and be a living example that our menstruation doesn’t have to be a curse. It can be a wonderful time of renewal and powerful magic. Embracing our moon time is about taking every opportunity to listen, nurture and embrace our cycle. It’s about sharing and supporting our sisters, educating our sons and our brothers, connecting to our inner magic and reclaiming our natural birthright.